Groin strain is a common cause of groin pain. Groin strain involves a tear of the adductor muscle group (clearly defined large muscles on the inside of the thigh). The strain may occur due to an overstretch or a forceful contraction and therefore is frequently associated with sports, particularly those involving running and changing direction (eg football, hockey). The strain is classified in degrees, indicating severity (grade 1, 2 or 3). Early RICE management followed by gentle stretching, and physiotherapy intervention can aid a speedy return to sport. Recurring groin strains often require a more in depth look at hip and leg biomechanics. Other possible causes of groin pain can include injury to the abdominal muscles or their attachments (eg Gilmore’s Groin), pubic bone and hip bone stress injury or fracture (eg distance running). 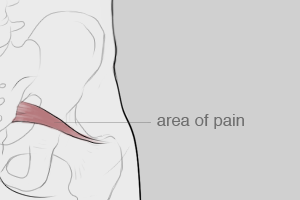 Pain felt in the groin may also be referred from areas such as the hip, pelvis and lower back. Our physiotherapists will assess your symptoms and biomechanics, diagnose and ensure appropriate management of these and other causes of groin pain. A bursa is a small fluid-filled sac that often lies between a tendon and bone preventing friction. When a bursa becomes inflamed (due to chronic irritation or acute trauma) it is referred to as bursitis. The bony point on the outside of the hip is known as the greater trochanter – this is an attachment point for muscles that move the hip. 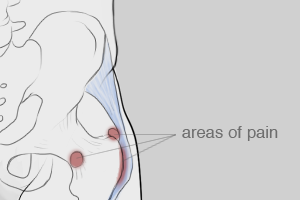 The trochanter has a bursa overlying it that occasionally becomes irritated with certain activities or positions, causing pain on the outside of the hip that is typically tender to touch (trochanteric bursitis). 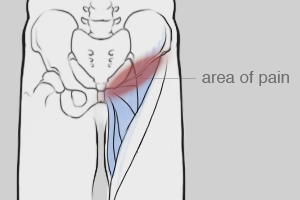 Another bursa located on the inside of the hip near the groin is the deeper iliopsoas bursa. When this bursa becomes inflamed the bursitis usually causes pain in the groin area. Our physiotherapists can assess and provide treatment for bursitis. Treatment can target the local tissues to settle inflammation, or by looking more holistically address faulty postures, positions and muscle imbalances. Injection may be necessary in more severe cases, and we can refer you to an appropriate specialist for this. Piriformis is a muscle lying deep within the buttock. It may become painful if it becomes shortened or overactive over time, or the muscle may go into spasm in response to injury. Pain can result from the compression or irritation of the sciatic nerve, which lies under or within the piriformis muscle. Muscle shortening may be caused by prolonged poor postures or positions (eg sitting), or sitting combined with heavy leg muscle activity (eg cycling, rowing). Overactivity of the piriformis can arise in response to muscle imbalances – particularly weak or inactive gluteal muscles, as these muscles are important for hip and pelvis stability. Seemingly unrelated biomechanical faults (eg pronation of the feet) may trigger piriformis syndrome due to the adaptive muscle imbalances. Our physiotherapists can assess and treat piriformis syndrome. Treatment initially focuses on settling the pain, generally by means such as manual therapy, electrotherapy, acupuncture. Further treatment will depend on the causes and often includes an exercise programme targeting weak and overactive muscle groups. Click here to download the Total Hip Replacement rehab booklet. The iliotibial band (ITB) is a superficial tissue on the outside of the thigh, extending from the outside of the pelvis and hip to just below knee. It is crucial for stabilizing the knee during running, and moves from behind the femur to the front while walking. The continual rubbing of the band over the lower outside of the thigh bone, combined with the repeated movement of the knee during running may cause the area to become inflamed. Sharp or stinging pain is most often felt in the outside of the knee and is usually caused by running. Classically, there is a biomechanical fault in the leg or foot which causes the band to become overactive and tight, and then rub on the knee. In extreme cases this can be present even on normal walking as the foot strikes the ground. Pain can progress up the thigh or lower down into the knee. Treatment offered by our physiotherapy team can include soft tissue release to the band and surrounding tight muscles. Other off-loading and pain relieving techniques may include stretching and foam rolling, electrotherapy (such as ultrasound), acupuncture, kinesio taping. Strengthening exercises can help reduce the muscle imbalances. Our physiotherapists can advise if orthotics are required and can advise regarding sporting technique and training. This is inflammation of a particular bursa on the inside of the leg just below the knee. A bursa is a sack of fluid that prevents friction between several tendons and the bone to which they attach. Pes anserine bursitis commonly is characterized by pain, especially when climbing stairs and local swelling. It can be very tender to touch. It is most commonly caused by biomechanical faults in the lower limb creating an overactivity or stress to the overlying tendon. Pain can also spread to knee joint. We aim to treat this by settling the painful inflammation by manual therapy and other pain relieving techniques such as acupuncture, electrotherapy and taping. We will also assess your leg biomechanics which may need to be treated concurrently (often through exercise) to reduce contributing factors. The fat pad below the patella (knee cap) is a soft tissue is at risk of being aggravated if the knee is hyperextended (over straightened). When forces are directed at the patella it acts as a shock absorber, thus protecting the underlying structures. In the case of a forceful direct impact to the kneecap, the fat pad can become impinged (pinched) between the femur (thigh bone) and the patella. As the fat pad is one of the most sensitive structures in the knee, this injury is known to be extremely painful. The symptoms are most commonly tenderness and/or swelling around the bottom and under the kneecap which is worsened by kneeling, squatting and climbing up and down stairs and/or hills. We can assess and treat fat pad impingement by offloading the fat pad to settle pain and inflammation. Management may also include activity modification and addressing biomechanics through exercise. Our physiotherapists can both treat and guide you on your return to your chosen activities. An irritation, inflammation and/or tear to the patella tendon is known as a patella tendinopathy. This is the tendon attaching the quadriceps muscle on the front of the thigh to just below the knee. The symptoms are anterior knee pain, often with an aching quality during and particularly after activities. These symptoms typically occur gradually without history of trauma. It can also be called Jumper’s knee, Patellar tendinosis or tendinitis and occasionally will progress to thickening of the tendon. It commonly occurs in athletes who are involved in jumping sports such as basketball and volleyball. There are several causes of the problem, predominantly due to biomechanical faults throughout the leg or pelvis, ankle stiffness, gluteal muscle weakness, poor core stability, repetitive overactivity of the knee or leg length differences. Our physiotherapists will examine these causes during assessment and direct treatment where required, as well as settling the local symptoms. We will guide you as you return to your sport or activity. The popliteus muscle is a thin, triangular muscle in the back of the knee. Its action bends the knee and rotates the leg. It is easy to strain or injure this muscle, especially if you are active and/or keen sports person as this muscle is an active stabiliser of the knee during physical activities while the leg is planted on the ground and the knee is rotating. Once the popliteus is injured, the symptoms mainly involve pain and swelling at the back of the knee. The main aggravating factor, once the muscle has been injured, is prolonged sitting positions where the knee is bent and the popliteus muscle stiffens up in a shortened position. There are usually no symptoms of instability or locking of the knee but there is usually an associated history of trauma. The main areas of injuries in golf involve the wrist, elbow, shoulder and back. Golf is a static posture using shoulder and spine rotation to generate a force to hit the golf ball. This force is translated down the arm through the elbow and wrist. Therefore, a bad technique or poor muscle control of the spine and shoulder will develop a pain as the swing winds up to generate its power. This can lead to muscle and joint strains. As the power of the swing is translated down the arm to hit the golf ball trauma can occur at the wrist and/or elbow causing muscle tears and ligament strains. Repetitive overloading of the wrist, elbow and shoulder can lead to such overactivity injuries in these joints and pain is usually represented by pain at each individual joint. The elbow is the most common site of pain. Ankle injuries are very common in sport but can also result from relatively trivial incidents such as turning the ankle when stepping off a curb. The lateral ligaments lie on the outside of the ankle and can be injured by inverting (or ‘going over’ on) the ankle. the ligament is made up of 3 parts and the extent of the injury depends on the exact mechanism of the trauma. There is generally sharp pain, swelling and possible difficulty weight-bearing. In the early stages RICE (rest ice compression elevation) and protection of the ankle are most important. Our physiotherapists can assess the extent of your injury and use a range of techniques to settle the initial symptoms, then build on strength and coordination around the joint, supporting your return to sport. Pain may occur at the back or front of the ankle that occurs with extreme movement or force. Anatomically two bones forming the joint pinch one another, more so if there is local bony enlargement due to repeated pressure or instability in the ankle. Our physiotherapists can help to establish the cause of your symptoms, help to settle the acute symptoms and can give advice regarding activity. Should your symptoms not respond to treatment we can refer you to appropriate specialists for further management. This presents as pain and stiffness in the achilles, often with a difficulty walking when getting out of bed. Symptoms can occur gradually with overuse or suddenly as the result of a strain. in cases of severe strain or tear, a feeling of being hit in the achilles can occur, and may be accompanied by a bang. Our physiotherapists can assess the extent of your injury and where necessary identify the potential underlying causes. treatment to settle initial symptoms will be followed by mobilisation of the soft tissues and loading and strengthening, which will then be incorporated into a functional programme tailored to your activity. In the event of diagnosing a complete tendon rupture, we will refer you to the orthopaedic specialist team for further management. The most commonly affected tendon is the tibialis posterior (muscle on the inside of the shin) and is associated with over pronation (foot flattening). This typically occurs in overloading or lack of support for the foot (e.g. increased running or running with worn out shoes). The tendon may show signs of inflammation, feeling slightly swollen or tender to touch on the inside of the ankle. Our physiotherapists will identify and treat the causes of your tendinopathy. Early treatment can include RICE, and further management may involve manual therapy to local stiff joints, offloading the tendon through taping or use of orthotics can also be of benefit. We can refer on to specialist for custom made orthotics if required. Shin splints can involve the muscle on the front or the inside of the shin. The muscle can pull against its bony attachment, causing inflammation. This often occurs with poor training techniques or a sudden increase in training. Pain presents itself along the shin typically during or after exercise. Our physiotherapists offer treatment to reduce the inflammation and pain. This will be followed by strengthening and weak or lengthened muscles, and addressing muscle imbalances that may contribute to the problem. Inadequate rehabilitation of ankle injuries may result in persistent symptoms, reduced performance in sport and greater risk of recurrence.